Growing up, there was a drawer in my fridge that I avoided like the plague. It emitted an odor so foul I was sure some poor creature must have died in there. It was my mother’s coveted cheese drawer, a space in which multiple pungent (and to the discerning 9-year-old’s eye, rotting), colorful cheeses lurked. 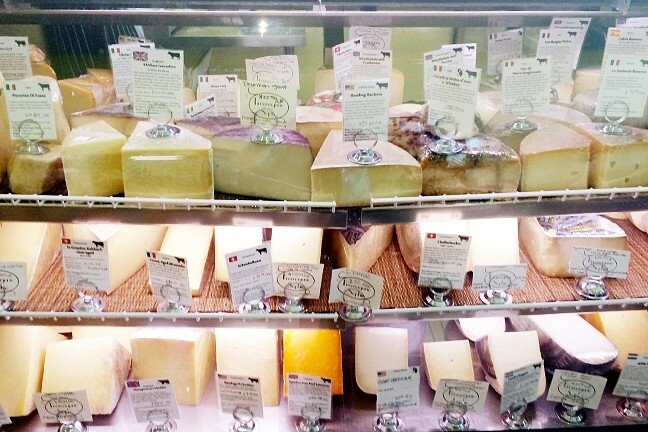 CHEESE, PLEASE : Fromagerie Sophie in SLO has cheeses from all over the globe. To this day, I blame my underdeveloped cheese palate on being exposed to far too many smelly cheeses too soon. It took me years to get on board the cheddar-cheese-that-isn’t-orange train. I now happily enjoy all varieties of cheddar, along with Parmesan, mozzarella, and manchego cheeses, to name a few. Though I still feel wary of say brie, goat cheese, and gouda. So I’m feeling a tad out of my league when my mom and I step into Fromagerie Sophie (which boasts cheeses from all over the world) in downtown San Luis Obispo, on Sunday, Sept. 4. I’m just coming off a Whole30 diet challenge (basically 30 days of no grains, dairy, alcohol, legumes, or added sugars) and picking up some excellent cheese to enjoy with wine at Baileyana Winery seems like a fitting celebration. 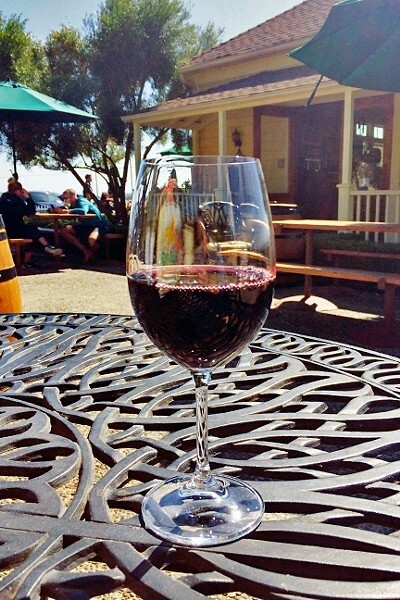 WINE IS FINE: A glass of Baileyana’s Trenza label Obispan red blend goes down easy on a sunny Labor Day weekend. My mom beckons me to try some sort of blue cheese hybrid that also boasts orange hues and smells, well, like a lot of things. I take a tentative nibble, make a face, and put the rest back. Some goat cheese gets a similar reaction. “Who are you?” my mom asks incredulously, offended on the cheeses’ behalf. I slink over to the other side of the cheese counter and in my most grownup voice ask the girl behind the counter which cheddar cheese she recommends. The cheese expert humors me by keeping a straight face and gives me a sample of the Montgomery’s Cheddar from England, which is described on its accompanying card as “reminiscent of the caramelized edge of a Sunday roast.” My taste buds sing. This cheese shall be wine’s BFF later today. Fancy cheeses in hand, we stop at the grocery store to pick up crackers, chocolate, olives, and salami for an afternoon feast. Things are bustling when we pull up at Baileyana, which is just close enough to town to feel convenient, and just far enough away to feel like an escape. The tasting room is in a sweet yellow repurposed schoolhouse building with roots going back to 1909. 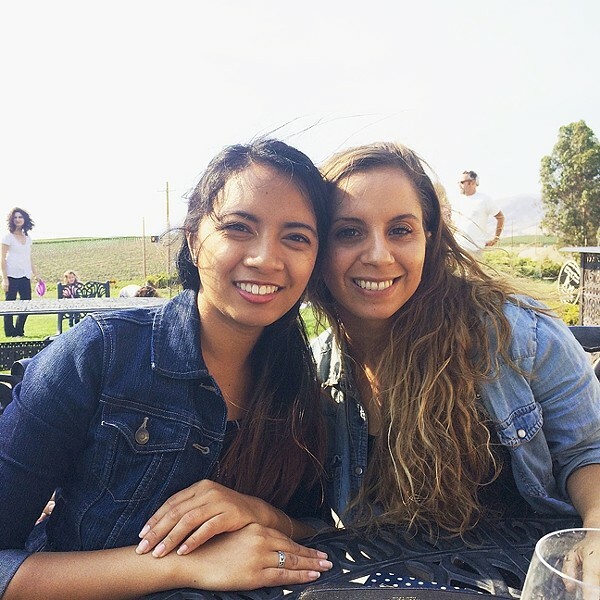 SUNDAY FUNDAY: From left to right: Paula Baniqued and Ryah Cooley enjoy wine in the sunshine at Baileyana Winery on Orcutt Road in SLO. We mosey up to the bar and start with a tasting of the winery’s Tangent label Ecclestone white blend with refreshing citrus notes and just enough sweetness. By the time we make our way to the last of the five wines on the tasting menu, the winery’s Trenza label Obispan red blend (my favorite, a full-bodied red with hints of blueberry and strawberry jam), my mom has signed up for a wine club membership (yay for future piggybacking on free wine tasting perks!) and my longtime BFF Paula, who just happens to be in town, is on her way to meet us. This calls for more wine! I get a bottle of the Obispan red blend for later and a glass of it to enjoy now, on the sunny yard at Baileyana. My bestie Paula and surrogate little brother, Bonn, arrive and we trade sips of wine in between mouthfuls of cheese and chocolate as happy pups frolic around and laughter fills the air. Ryah Cooley’s got a glass of red wine in one hand and a fistful of popcorn in the other at rcooley@newtimesslo.com. WINE NOT? : Get some tasty, cheesy nibbles at Fromagerie Sophie (1129 Garden St. in SLO, open Monday through Saturday from 10 a.m. to 6 p.m. and Sunday from 11 a.m. to 4 p.m.) before sipping some vino at Baileyana Winery in SLO (5828 Orcutt Road, open daily from 10 a.m. to 5 p.m.; closes at 6 p.m. Fridays). Visit fromageriesophie.com and baileyana.com for more information.